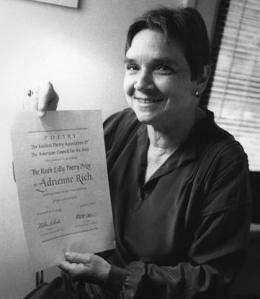 Adrienne Rich was born in Maryland in 1929. By the age of 10 she was already reading heavyweight poets such as Keats, Tennyson and Blake. She was enormously successful in her lifetime and is now regarded as one of the most widely read and influential poets of the second half of the 20th century. Her poetry is intensely personal – she explores her relationship with her husband, the breakdown of their marriage and his suicide – yet she also grapples with the major issues of the day – gender politics, the threat of nuclear war and the benefits of psychoanalysis. We go on a journey with her as she develops from ‘man-hating’ feminist into an advocate for a ‘genderless’ identity – ultimately concluding that we need to explode the myth that men should behave one way and women another.